Select the thumbnail for a screencast keyed to instructions. Borrowing from another library using the library catalog is just as fast as using WorldCat's FirstSearch interface or the ILLiad fill-in form. Perform a search and limit it to "Books at Other Libraries." View the full record for an item you want. 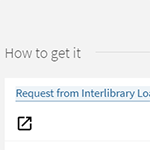 Select the "Request from Interlibrary Loan" link if Hamilton does not provide access to the item (see below). Log on to ILLiad to view the pre-populated request form. Click "Submit Request" at the bottom of the form. Your Hill Card can be used to check out books at the area libraries listed below or any Connect NY member library. Ask a library staff member about reciprocal borrowing and other agreements between our libraries before you travel. Hamilton faculty, students, and staff may use these libraries, but do not have borrowing privileges.